When we arrived at Newhailes I didn’t really know what to espect, I knew it was owned by The National Trust for Scotland and when I researched the site, a photograph of a victorian building came up. Since this was my forth project with the Green Team, I was starting to get used to working with them. I was pleasently surprised when I realised where we were going to spend the day. A group of beautiful old buildings surrounded by fields and tall trees. When we got out of the van we met our ranger who gave us a brief talk about Newhailes and its history. Then she talked about what we will be doing. We were all excited for our first task ; tree planting. Some of us took a garden fork, the others a wheel barrow and we went to the back garden. 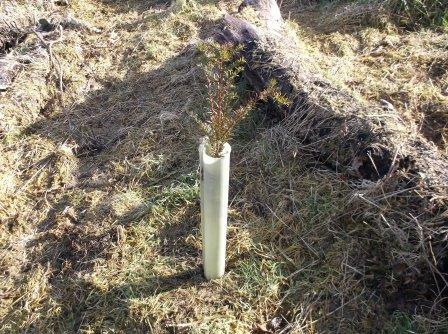 There we found some small trees waiting for us to replant them somewhere they could grow and become magnificent trees. So we took them out of the soil and we headed off to the hillside. After a short walk we arrived at the planting site and received a brief class on how to plant a tree. 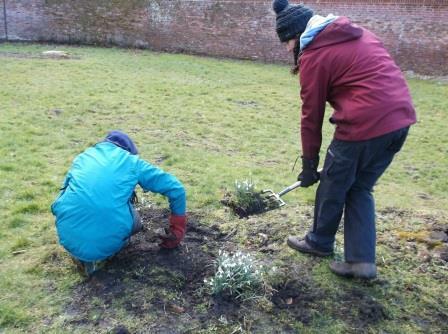 A few minutes later we were all in pairs putting the small trees back into the soil. At the end we had a wide range of trees from sweet chesnut trees to rose bushes beautifully planted on the hillside. Very proud of our accomplishment, we headed back to the main building. 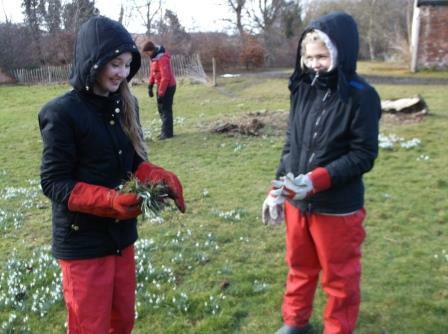 After lunch we started our second task : remove snow drops from the front garden and replant them somewhere else. Our ranger explained to us that they wanted to recreate the garden that used to be there around 200 years ago. They took samples of the soil and analysed them to identify whitch plants and flowers were in the garden back then. She told us that if the snow drops weren’t replanted they will be destroyed when they will plant the other flowers. So we took our garden forks and started taking the snow drops out of the ground and replanting them either sides of the alley. That finished, we cut some branches next to the garden and we went back to the main building. Our ranger talked about the owls that live in the area and what they eat. We even took a look at pelets, mice, rats and shrew bones found in the field. Then we made some jewelery out of the branches we cut which looked very nice. Before going back we gathered next to the van and discused the ups and downs of the day. I received my John Muir Discovery Award and asked if I could do a summary of the day for the blog. 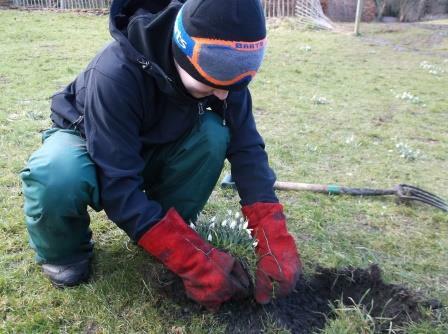 I really enjoyed this project at Newhailes and I am really excited to come back and see how our trees are going.